Today I am grateful for all of the people that make me happy, and the opportunity to spend the day celebrating with good food and drinks with the people I love. Being optimistic is essentially maintaining a positive outlook for longer than a negative outlook. And the key to doing that is being resilient and persevering, according to an interview with Margaret Wheatley for The Intelligent Optimist magazine. Basically in order to be optimistic you need to understand that there will be bad days, experience them, and then bounce back. It’s looking at the annoying bad things that happen, accepting them, and moving along. The sustained frustration at negative things in life is at the basis of pessimism. Instead of getting mad that bad things happen, accept the setback and failure. They are an inescapable part of living. Understanding that bad days will pass and taking the lesson in them for what its worth rather than dwelling on the negative repercussions of the event is the difference between seeing things as glass half empty or glass half full. It’s Thanksgiving week, and that means that those of us in the United States have lots to look forward to – spending time with relatives, eating loads of delicious food, and relaxing with a few days of work. 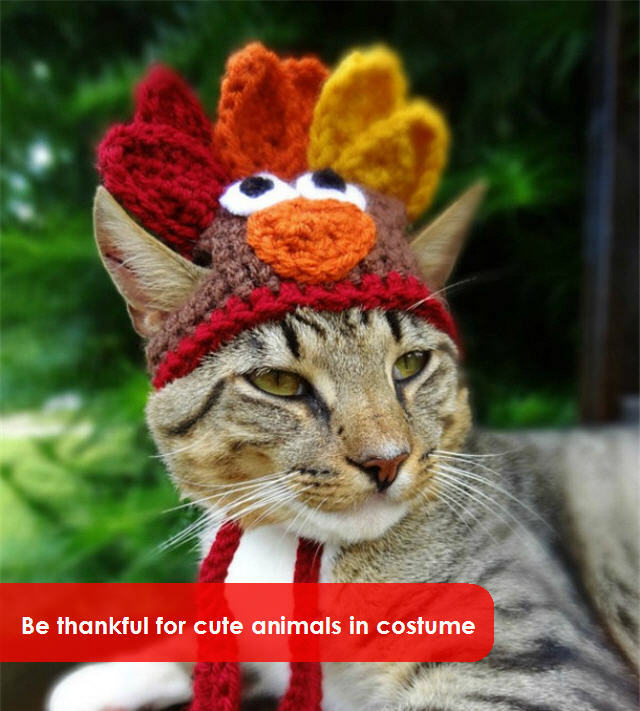 Then, of course, there is the added bonus of cute animals in Thanksgiving themed costumes. Check out these outfits.